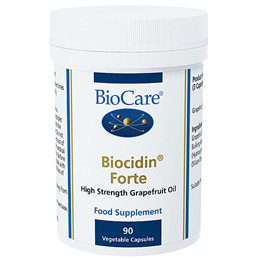 Biocidin Forte provides a concentrated source of grapefruit seed extract. Grapefruit seed extract has been used in food to reduce bacterial and yeast spoilage. It may help to maintain the balance of intestinal flora. Grapefruit Oil (Citrus grandis skin, pulp and seed), Bulking Agent (Cellulose), Capsule Shell (hypromellose), Anti-caking Agents (Silicon Dioxide and Magnesium Stearate). Take 1 vegicap three times a day with food or as professionally directed. 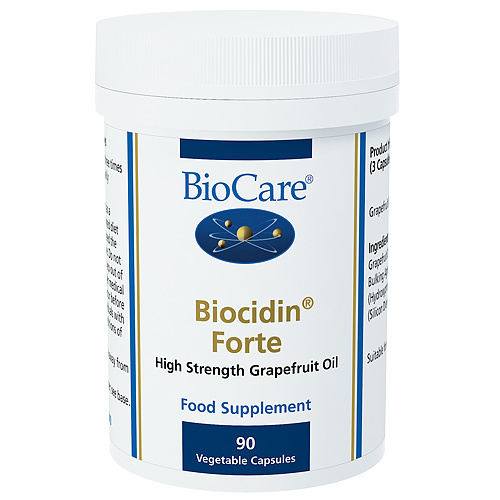 Below are reviews of Biocidin Forte - Grapefruit Oil - 90 x 450mg by bodykind customers. If you have tried this product we'd love to hear what you think so please leave a review. I have always used grapefruit seed extract whenever I felt like a cold was approaching. Decided to try grapefruit oil and have not been disappointed. Helps to fight the first signs of a cold every time when taken together with high doses of vitamin C, Echinacea drops and raw garlic. Good stuff! A must in the household.